Rachel Hutchisson of Blackbaud, speaks with Grant Garrison, managing director at GOOD Corps, about how brands can purposefully align themselves with causes and movements to advance social good. Susan McPherson talks about what works (and what doesn't) when corporate and nonprofit brands engage in hashtag activism on the Champions for Social Good podcast. Rachel Hutchisson speaks with Catherine LaCour, CMO at Blackbaud, about how organizations can strengthen the social economy by leveraging data, individual impact & radical collaboration. Learn key insights into how companies are giving back to society and engaging with their employees, and how their social investment strategies are being integrated into global business strategies. In this episode of the Champions for Social Good Podcast, Rachel Hutchisson speaks with Jenny Lawson, president of Networks at Points of Light about trends in corporate engagement. In this episode, we talk with Aria Finger, CEO of DoSomething.org, a “tech-company” style nonprofit that teaches 5.5 million teens and young adults ages 13-25 in the United States to make an impact. We talk with Alice Korngold, President and CEO of Korngold Consulting, about trends in collaboration across the social good sector, including partnerships between corporations and nonprofits. We sit with Francoise Girard, President of the International Women’s Health Coalition (IWHC), to talk on gender equality, advancing women’s sexual and reproductive health rights, and the SDGs. In this episode Leor Rotchild, Executive Director of Canadian Business for Social Responsibility, speaks with us about the influence of corporate social responsibility on investors and stock price. In this episode of the Champions for Social Good Podcast, Jamie Serino speaks with Grady Lee, Co-founder and Chair of IMPACT 2030 and CEO of Give2Get. In this episode of the Champions for Social Good Podcast, Jamie Serino speaks with Alison Holder, Director of Equal Measures 2030 about harnessing gender data for gender equality. In this episode of the Champions for Social Good Podcast, Minister Tashkovich relays how he first became involved in volunteering to help build the newly formed Republic of Macedonia. 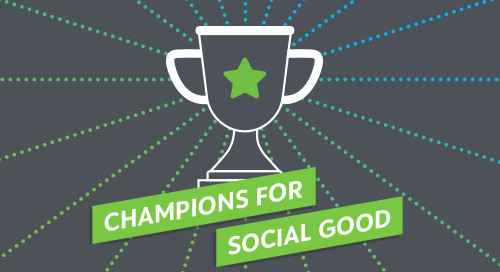 In this episode of the Champions for Social Good Podcast, Jamie Serino speaks with Michelle DiSabato, Impact Advisor for the Corporate and Foundation Solutions division of Blackbaud. In this episode of the Champions for Social Good Podcast, Jamie Serino speaks with Brandolon Barnett, Director, Partner Solutions at Growfund with Global Impact. In this episode of the Champions for Social Good Podcast, Jamie Serino speaks with Matt Klein, Executive Director of the New York City Center for Economic Opportunity. In this episode of the Champions for Social Good Podcast, Jamie Serino speaks with Dr. John Feather, Chief Executive Officer of Grantmakers in Aging.